“I think it’s ready,” Gertie said, and dipped a ladle into the huge pot on her stove. The fumes alone had made my eyes water so badly that I’d finally put on the goggles Ida Belle gave me when I arrived twenty minutes ago. Despite the potentially explosive fumes, the aroma was actually quite nice. “It has a sort of cinnamon smell to it,” I said. This was the first time I’d been present for an official tasting of Sinful Ladies Cough Syrup. Ida Belle and Gertie had been working on a new flavor, and they claimed their taste buds were officially numb. They said that at this point, they wouldn’t be able to tell the difference between their brew and a real bottle of cough syrup. So I was the official taste tester. Payment was all the Sinful Ladies brew I could handle, a pot roast, and a container of freshly baked chocolate chip cookies. It was a darn fine gig if you could get it. “It should have a bit of cinnamon taste to it as well,” Ida Belle said. “Or maybe even chilled,” Ida Belle said. They both watched me as I blew on the whiskey until the steam stopped coming off it. “Go for it,” Ida Belle said. “Will you shut up and let the woman drink?” Ida Belle asked. I put the glass to my lips and took a big swig. Almost immediately, my eyes watered and then crossed, and I yanked off the goggles. I swallowed and thought my throat was going to explode. I opened my mouth to talk, but nothing would come out. Ida Belle and Gertie watched me closely, and I wasn’t sure whether to feel comforted or worried that neither had flung me onto the floor and attempted CPR. It was probably only seconds, but felt like much longer, when my eyes went back into focus and I sucked in a breath. It burned coming in and smelled of cinnamon coming out. A flush swept through my entire body, and the soreness I’d had in my neck since I’d gotten out of bed vanished completely. “Is Sinful Ladies membership down?” I asked. I held up my hand. “I was joking.” And if Gertie thought the cough syrup would result in a potential membership increase for the Sinful Ladies Society, I didn’t want to know about it. “So is it a thumbs-up?” Ida Belle asked. “Just how much of this stuff do you make?” I asked. “But I only know of one flavor,” I said. “If you’re not chewing, it’s not food,” Gertie said. “Got that right,” Gertie said. “What did you do?” Gertie asked. It was true that over half of my past interactions with Carter had been over my less-than-legal transgressions that put me smack in the middle of police matters, but now that we were in an official relationship, things were strictly personal more often. “Stop!” I said, and answered the call. “Are you still at Gertie’s house?” Carter asked. “Yeah, why?” His voice sounded tense, and that was never a good thing. As far as I knew, none of us had meddled in police business since the poacher case, but with Gertie, you never could be certain what else might have transpired when Ida Belle and I weren’t around to reel her in. I hung up the phone. Ida Belle and Gertie had ceased all conversation and were staring at me, worried expressions on their faces. They knew my serious voice, so they knew something was up. Of all the things they might expect to hear, the election results were probably low on the list. During the last mayoral election, Ida Belle’s nemesis and the first lady of horrible, Celia Arceneaux, ran against Ida Belle and Gertie’s friend Marie. Celia won, but Marie asked for a recount based on rumors of ballot tampering. The audit had started weeks ago, and at the rate they were moving, we’d decided it would be time for a new election before they announced the results. In the meantime, Celia held Sinful hostage, making Carter’s life miserable and using her position to bully everyone else into doing her bidding. If Celia maintained her position as mayor, I predicted an exodus from Sinful equivalent to that of Moses leading his people out of Egypt. They both spoke at once, and Gertie reached over and grabbed Ida Belle’s arm. She didn’t have to spell it out. So much was riding on this election. Ida Belle and Gertie had already said they’d seriously consider moving if Celia stayed in office, and even if Carter was allowed to keep his position, he had already stated that he didn’t feel he could work for Celia. I was Celia’s number one target for takedown, so my plans for future residency definitely depended on what everyone else decided. I really liked Sinful, but without Carter, Ida Belle, and Gertie, it would just be another small town. I could find one of those anywhere. The scene downtown looked like geriatric Woodstock. Women milled around the street in random states of dress, some without shoes, many with rollers in their hair, one wearing a green paste on her face, and one still stirring something in a mixing bowl. Some of the men wore muddy boots and were holding rifles, which would be alarming anywhere but Sinful, but here was quite common. Other men stood beside coolers that reeked of fish, and as we approached the crowd, one man ran from behind the buildings where the bayou was located, clutching a rod with a fish still on the line. Apparently, everyone was anxious to be front and center for the big announcement. I made a note of where live fish guy was standing in case I needed to borrow the fish and slap anyone with it. I’d done it accidentally once, and I’d been itching to do it on purpose ever since. We weaved in and out of the crowd and finally spotted Marie near the front of the sheriff’s department. She wore a pretty blue dress and looked kinda pale. We pushed our way through the crowd and managed to squeeze in beside her. “There should be an IQ test for a lot of things,” Ida Belle grumbled. The door to the sheriff’s department opened and Carter walked out, followed by three men and one woman all wearing black suits and white shirts. It was either the Secret Service, the men in black, or the auditors. I was going with auditors, but I reserved the right to change my selection. This was Sinful. Carter scanned the crowd and locked in on me. I started to do the ole raised eyebrow thing or a slight hands up, but the strained look on his face told me everything I needed to know. Either Celia was still in charge or he didn’t know yet and was as worried as the rest of us. He raised his hands and waved at the crowd of people. The noise level dropped, but only by half, as people continued to move about and talk in low voices. Ida Belle stuck her fingers in the sides of her mouth and whistled. An ear-shattering, glass-breaking whistle. My hands flew involuntarily over my ears and as I glared at her, I noticed Gertie pulling some cotton out of her ears. “She does it every time,” Gertie said. “A little warning would have been nice,” I said. Gertie gave me an apologetic shrug, and I turned back around to see Carter waving at one of the suits. I watched as the suit moved closer to the crowd. Midfifties. A hundred and eighty pounds, twenty of it potbelly. Skin that hadn’t seen the sun in years. Delicate hands. Only dangerous if he was auditing you and you were a tax evader. “Nobody cares!” a man shouted. Given that his skin was almost glowing white, I didn’t think it was possible, but Wilkinson scanned the crowd and appeared to pale a little. He’d probably finally clued in to the array of firearms. A huge cheer went up in the crowd, so loud that I couldn’t even hear when he said Marie’s last name. Gertie screamed and hugged me so hard I would probably bruise. Ida Belle was grinning so big, I was afraid her face might break, as it rarely worked out that hard. Almost everyone was cheering and bouncing and hugging. And then Celia walked up to Marie and started yelling. “Why am I always the whore?” I asked Gertie. If Celia had been capable of it, I swear her head would have spun around on her neck just like in The Exorcist. 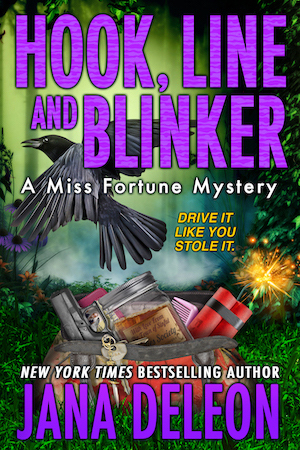 She sputtered several times, then pulled a set of keys out of her purse. I was waiting for her to fling them in Carter’s face, but then Celia did something entirely unexpected. Shoving people to the side, Celia bolted away from the crowd and in between the buildings, screaming that she would throw the keys in the bayou before she turned them over to lying, cheating trash. Everyone was so stunned that it took at least a couple seconds before anyone reacted. Then the chase was on. Gertie was the closest of our group to the edge of the crowd so she got out first, but Ida Belle and I were close behind. The guy with the fish was the farthest out, as the crowd had forced him to stand some ways back before the announcement came. He was lumbering toward Celia at a pace much faster than I would have given him credit for, especially as he was still clutching the rod and the fish. I passed Gertie as we rounded the building and saw Celia about thirty feet ahead, not too far from the bayou. She flung her arm back, the keys still clutched in her hand, and I knew she was about to throw them. “Hell, no!” the guy with the fish yelled, and then tossed the enormous bass at Celia, as though he were skipping stones on the water. The fish hit the ground before it reached her but slid under her foot as she raced forward. Her leg shot out from under her and she fell backward, flinging the keys up in the air. I dodged to the right and snagged the keys. Gertie did not have time to put on the brakes and ran right over Celia, treading in the middle of her chest before falling forward onto the fish. Gertie’s weight on the slimy fish didn’t slow it down one bit. It continued its forward progress down the bank and deposited both of them in the water. As Gertie struggled to stand up, the guy with the rod started reeling the fish back in. When Gertie came dripping wet up the bank, Celia sat up and pointed a finger at her. “I want her arrested for assault,” Celia said. Carter, who was standing in between Celia and the bank, raised his eyebrows. I could tell he was struggling not to smile. “Except maybe her ego,” Ida Belle said. The entire crowd took on innocent expressions with lots of head shaking. Carter looked over at me, Gertie, and Ida Belle, and we shrugged. “Did you see him throw the fish?” Carter asked Celia. Celia looked down at the white bra peeking out of her torn dress and shrieked. She jumped up from the ground, clutching her chest as if she were having a heart attack, and glared at me. “This is war,” she said to Ida Belle.